My new original Acrylic painting in progress. I had actually started it about 2 years ago and somehow did not like it. I took it back out and repainted a good portion of it. I am actually liking it more now. Funny how things work out. I guess the first draft of it was just not the right time for me to paint it. I can't wait to get it done though. I still have a lot of detailing to do. I'll keep posting updates on it here on my blog as well as my Flickr! I've finally found my sister and her family in Dubai! I had not seen or heard from them for such a long time and miss them dearly. 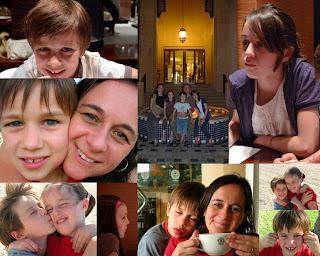 Thanks to this wonderful world of the web...I finally see how beautiful my nieces and my nephew have grown to be. though I still do not have contact with them...I still LOVE them all dearly! You can now at Art Fire as well as Etsy! Hope to see you all there soon! I would like you all to meet DRINCO the DRAGON. 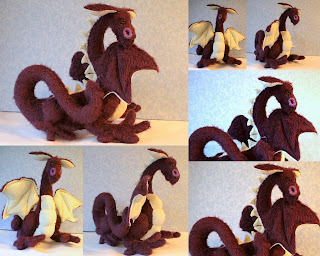 This is the second soft sculpeted dragon I have made. They are just so much fun to do. The eyes have so much personality! My husband would like to keep them at home, but they muct be listed in my shop...we already have four cats at home!!! I would like to present my newest creation. Her name is Glyndon and see is very sad. Why you ask? She has lost her "rider" and does not know where to look for him. Feeling abandoned I will try to find her a home in my Etsy shop. She is the first of my dragons. I enjoyed making her so much that I will make a few more. Measuring roughly 15" tall and 21" long my Bendy recycled fairies can actually sit on her back! Check back so for more! Well, Spring is getting near and my creativity is in full bloom...no pun intended! Thought I would try something new. I am developing my own fabric sculpting technique. This is actually really just STEP 1. I will keep my blog updated with the progress as she blooms into a beautiful flower. I am really excited about this project!!! 5"X7" print on wood panel for those who cannot afford the original! 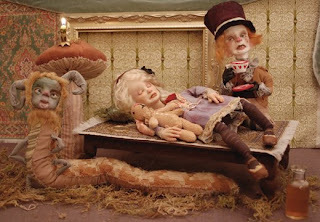 Wooded Woods is an amazing sculptor / art doll maker.Full of detail and VERY dark humour! Ever since we got out house cleansed of pixies I've been creating all these little fairies. I'm guessing that I miss having these little creatures around me. Everyone should have a little one to keep them company!! !